Your VIP Private Jet, which normally seats more than 40, has been custom-fitted for only 15 travelers with luxurious leather club seats and posh interiors. Your cabin crew will graciously anticipate all of your in-flight needs, while serving first class cuisine with fine wines and champagnes. Experience arrivals like royalty, often at private terminals, where you hardly realize the usual customs and immigration formalities have taken place. Mauritius – See the Seven Colored Earths when not relaxing on white sandy beaches. 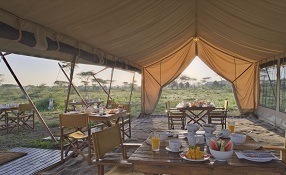 Tanzania – Experience the ultimate in tent camping, ideally situated to see the famous Great Migration. 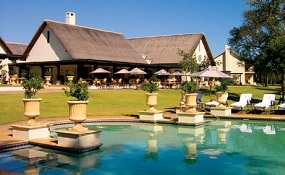 Zambia – Luxuriate along the banks of the Zambezi River and see Victoria Falls. 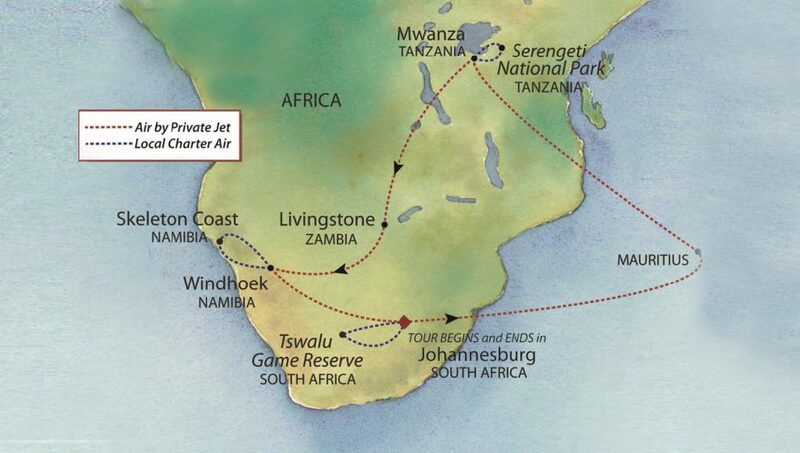 Namibia – Ride enormous sand dunes and see a Cape fur seal colony and shipwrecks. 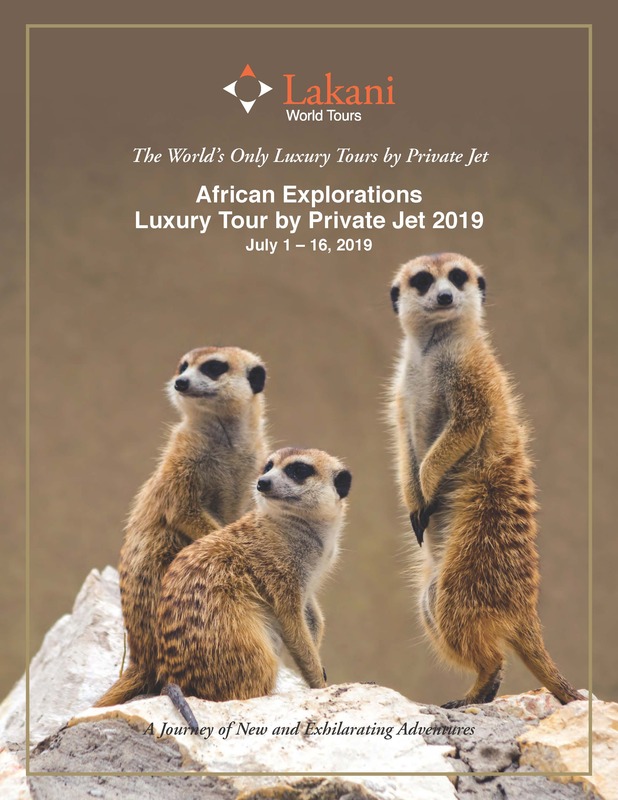 Tswalu Kalahari, South Africa – Take a guided bush walk to see a meerkat colony. 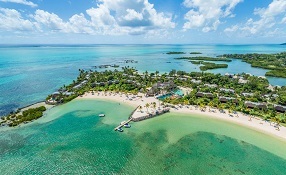 Mauritius – Enjoy the beautiful beaches and colorful natural wonders of the Indian Ocean. Tanzania – Experience the ultimate in tent camping, ideally situated to see the famous Great Migration and a wide variety of wildlife on twice-daily game drives. 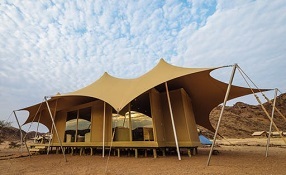 Namibia – Immerse yourself in the desert culture of the remote land where a rich diversity of desert-adapted wildlife, like elephant, giraffe, and oryx make their home. Ride enormous sand dunes and see a Cape fur seal colony and shipwrecks. Tswalu Kalahari, South Africa – Explore the diverse habitats of Tswalu, with the stunning Korannaberg mountain range as a back drop. Tswalu’s smaller, but beautiful, mammals offer the most special sightings of all. The meerkat viewing is fantastic, while aardvark and aardwolf can also be seen here. 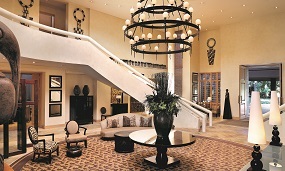 Indulge in sophisticated splendor up on your arrival in Johannesburg. A secluded and spacious luxury resort in the Indian Ocean. 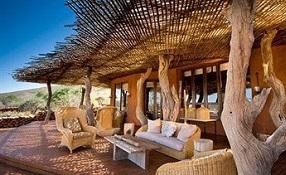 A luxurious semi-permanent tented camp that moves within range of the Great Migration. Luxury, steps away from the falls. Located within the true Namib Desert, home to a rich diversity of life and boasting the Kaokoveld’s best viewing of desert-adapted wildlife.